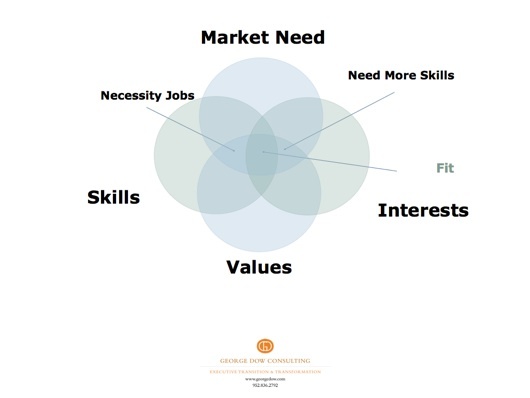 After you have taken the time to do the exercise above, you will then be ready to insert your recurring skills, interests and values into the graphic below. If you view this as a target, note the implications of the center hits and the side misses. To the left of center you see “necessity jobs”. This choice might serve to pay the bills, but the passion for the work is not what it might have once been. Perhaps you are thinking it’s not time for a big change yet.